This recipe is a nice change from your traditional BBQ Chicken. 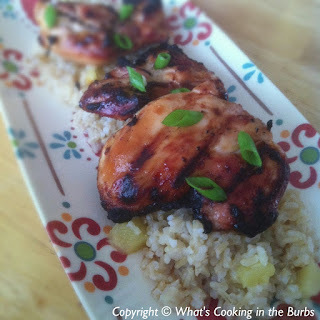 It's easy to prepare and paired with the Pineapple Rice...it was fantastic! Combine all ingredients (except green onion) in a large zip lock baggie; add chicken. Seal and marinate in refrigerator 4 hours. Remove chicken from bag and place on grill rack coated with cooking spray; grill about 15 minutes or until done. Garnish with green onions, if desired. Enjoy! Note-I like to make some extra marinade to baste the chicken with. Add the pineapple, salt, and ground ginger to the hot cooked rice. Fluff the rice with a fork, mixing in the pineapple at the same time. Cover and let sit for a few minutes to warm up the pineapple. Add the green onion to the rice and fluff again with a fork while mixing in the green onion. Enjoy! This meal sounds sensational! Thanks for sharing at Simple Supper Tuesday. This sounds very yummy and summery! I am seeing so many wonderful grilling recipes! Yum. We had the grill out a couple times and then it rained and rained! Looks wonderful! And I love Asian food :-) Pinned and shared on Google+ today ! Thank you for sharing at our All My Bloggy Friends Party ! I found a recipe on this blog that I wanted to try really bad, I did not keep it and when I went back to get it, it ws gone. I don't remember the name of it, but it had two different kinds of Italian peppers, the last was optional and it had fresh basil. I was hoping you could repost it or email it to me. Thanks.